•More National Merit Award Winners than any other all-male, Catholic school in Westchester or the Bronx over last decade. •Three levels of academic study—Superior Talent Enrichment Program (STEP), Honors and College Prep—to accommodate and challenge all levels of learning, giving students the ability to advance. •New three-year Science Research Course with class, group and independent study, and external professional research mentors. •Italian, Mandarin and Spanish, plus Latin for students in the Superior Talent Enrichment Program (STEP). •Annual cultural immersion trips to Ireland, Italy and Spain. •85% of our caring and credentialed faculty have advanced degrees in their field. •Biweekly academic updates to parents via online portal for total transparency. •17 Advanced Placement courses offered. 63 students earned Advanced Placement Scholar Awards in 2017-18. I am an alumni of both the lower school (87) and the prep (91). My older son is a current sophomore and my younger son is excited to start as a freshmen next year. I couldn’t imagine any other place I would want my boys to turn them into men! 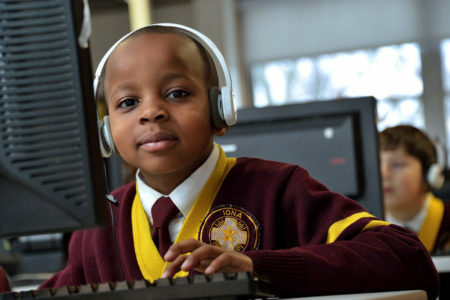 From faith, to education, to service, to sports, the Prep is the whole package! We are delighted with the education our son is receiving at Iona Prep. We feel he is not only being challenged academically, but also being guided in his personal and spiritual development. The faculty and staff are deeply invested in and committed to helping the young men reach their potential while developing the skills and confidence necessary to succeed. The school is responsive and approachable to parents. Our son is an only child, but he has hundreds of brothers at Iona Prep. The world is a great big place; thanks to all that he's gained at Iona Prep, we feel he will be ready for all that he may encounter. It is truly a special place. My eldest son is a sophomore at Iona Prep and my youngest son is beyond excited to join his brother at the Prep in September. We feel fortunate that we can invest in our sons’ future and provide them with an Iona education. Meeting with my son’s teachers is always a positive experience...I truly feel that they know and care for my son. I am grateful for the service component of an Iona education, because our boys need to feel that their actions CAN and WILL make a difference in our world. It goes without saying that the administration, coaches and maintenance staff all work together to create the best environment for the boys. They lead by their exemplary behavior!